The Achilles tendon is large thick tendon located behind your ankle, and is the strongest tendon of your body. The Achilles tendon is formed from two muscles in the leg called the Gastrocnemius and the Soleus muscles and insert on the back portion of the heel bone. The function of the Achilles Tendon is to control the downward motion of of the foot (a term doctors call plantarflexion) or other words allow one to get on the their “tippy toes”. A properly functioning Achilles tendon is critical for walking, running, jumping and daily activity. An Achilles Tendon Rupture is when the Achilles Tendon is torn resulting in separation or discontinuity of the tendon, resulting in loss of tendon function. Most commonly people use the term Achilles Tendon Ruptures to indicate complete (or full thickness rupture) of the Achilles Tendon. 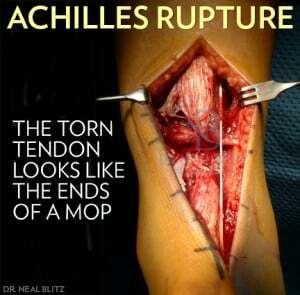 The Achilles Tendon can be partially ruptured as well. An Achilles Tendon Tendon Rupture is synonymous with An Achilles Tendon Tear, and can be used interchangeably. Achilles Tendon Ruptures generally are the result of an acute injury patients will have swelling and pain. Classically at the time of the injury patients will say that it felt like being in behind the ankle with a bat or a hatchet. Ouch. Commonly, it will drop a person to the floor and they won’t be able to walk on the affected leg. Some patients develop bruising in the Achilles area as well as within the foot and toes. The Achilles Tendon itself is commonly painful to touch, at least for the first several days. The Achilles Tendon often has an empty space or divot where the rupture occurred, though swelling and fat tissue may make this difficult to feel. Patients may still be able to move their foot in a downward direction (plantarflexion) even after an Achilles Tendon rupture because there are other tendons and muscles that contribute to this motion, so its important to not rely on the ability to point the foot down as a diagnostic tool. Achilles Tendon Ruptures are generally the result of a sudden or acute injury. They commonly occur in people who are more sedentary and newly engage in a sport or activity program – and have been called “weekend warriors”. Though Achilles Tendon Ruptures occur in professional athletes as well. The Achilles Tendon Rupture frequently occurs when the Achilles Tendon is overstretched with a sudden jump, pivot or sprint. Anatomically the Tendon can be super stretched when the knee is straightened and the foot direction is upwards (towards the nose – or medically dorsiflexion). Slip and falls can result in ruptures. Oral medications can weaken tendons making susceptible to rupture, and these include fluoroquinolone antibiotics which are commonly used to treat urinary tract infections and skin/soft tissue infections. Some examples of fluoroquinolone antibiotics are Ciprofloxacin, (Cipro®), Levofloxacin (Levaquin®, and Oflaxacin (Floxin®). Injectable Cortisone or steroids with the area of the Achilles tendon can also weaken the tendon and promote rupture. Age may also play a role in Achilles Tendon Rupture and tendons tend to weaken over time. Some systemic medical conditions such as inflammatory arthritis and diabetes may also interfere with tendon integrity. Certain blood types have been also suggested to be associated with Achilles Tendon Tears. Additionally, previous Achilles Tendon Injury may weaken the tendon and promote rupture. Achilles ruptures are diagnosed with a history and physical performed by a professional. The history often will provide certain clues into whether or not the Achilles Tendon was injured. On the exam, surgeons feel the area and may actually feel the rupture. A clinical test to evaluate for a rupture is with the Thompson test, which involves squeezing of the calf which to see if the foot moves. Theoretically squeezing of the calf will cause the foot to point downward when the Achilles is intact, though this test may be inaccurate for rupture. Another test is to have the patient lay on their stomach and bend both knees, and if the feet are situated at different levels this may suggest rupture. Diagnostic testing is very useful in determining whether or not the Achilles Tendon is ruptured, especially when differentiating between a partial or complete rupture and/or determining where exactly the tendon has ruptured as this may influence the surgical decision-making. Since x-rays evaluate bones, they are of little diagnostic value though ruptures at the insertion of the heel bone may also pull off some bone, called an avulsion fracture. Ultrasound may uncover a rupture. Magnetic resonance imaging is the best study (the gold standard) for the viewing the Achilles Tendon and can readily identify a rupture, severity, location and possible tendon retraction. Magnetic resonance imaging is not necessary to diagnose all ruptures and the decision for treatment/surgery could be made by the history and clinical exam alone. As with any foot and ankle injury, it is important to seek medical attention. With Achilles Tendon Injuries it is best to seek care immediately after the injury. Depending on your overall health, symptoms and severity of the Achilles Tendon Rupture, treatment can be conservative or with surgery. The basis for Achilles Repair Surgery involves re-attaching the ends of the the torn Achilles Tendon. The Achilles Tendon Repair involves weaving strong suture within the Tendon and tieing the ruptured ends together. While several techniques may be used, the repair generally depends on the location of the the tear within the tendon. Mid-substance Achilles Tendon Repair: Here the Achilles Tendon ruptures centrally and there is tendon on both sides of the rupture. This is the most common location for Achilles Tendon Ruptures, which occurs about 4cm up (about 3 finger breadths) from the heel bone. Its is called the watershed area because the Achilles is thought to have less blood supply in this area, making it susceptible to load failure. Often the repair is called a mop-end repair because the ends of the tendon resemble the ends of a mop. In this classic Achilles Repair, the tendon ends are sutured together by weaving suture throughout both ends of the tendon. The ends are tied together centrally at the rupture site. The most common stitching technique is called the Krackow stitch which is an interlocking stitch that holds the tendon ends securely. *Dr. Blitz’ Achilles Repair Technique: Dr. Blitz technique for Achilles repair was featured in Podiatry Today, which involves performing a double layered Krackow stitch to provide two layers of strength – a deep layer and a superficial layer. More importantly, Dr. Blitz’ technique is a 3-knot repair rather than 4-knot. The ‘knots’ are where the suture repair can fail, and Dr. Blitz’s modification allows for the less knots, and theoretically less likelihood of failure. Insertional Achilles Tendon Repair: Here the Achilles Tendon is ruptured directly at the heel bone. In other words, the Achilles is pulled completely off the bone. The repair involves a tendon-to-bone re-attachment rather than repair of the tendon itself. A special suture with a bone anchor is used, and the technique is medically termed tenodesis. Several bone anchors can be used to secure the tendon to the bone, and the suture is also weaved into the Achilles Tendon. While the location of the rupture is important to indicate the type of repair as discussed above, the severity of the rupture also plays an important role in the repair. While most repairs are straightforward there are instances where the tendon is completely shredded and simple repair is not possible. Sometime shortening occurs with the rupture as well which can be problematic if not corrected at the time of surgery. Flexor Hallucis Longus Tendon Transfer Achilles Repair: This repair involves rebuilding the Achilles Tendon using the tendon (flexor hallucis longus) that functions to curl the big toe down. The flexor hallucis longus also functions on the ankle an accessory to bring the foot downward, and is ideal for use with certain Achilles Repair surgeries. In general, the flexor hallucis longus tendon is used when there is a defect in the Achilles Repair. The flexor hallucis longus repair is common technique used when rebuilding the Achilles Tendon with chronic injuries. The flexor hallucis technique can be useful for when acute ruptures with a defect regardless of the location of the Achilles Tendon rupture within the tendon. Achilles Turndown Flap: Another technique to manage Achilles Repair defects involves using the Achilles Tendon itself to bridge the tendon gap. Here the top part of the tendon (or portion of the tendon higher up the ankle) is specially cut, rotated and flapped downward to bridge any gap. This technique requires enough tendon available to flap down and is not a useful technique for ruptures close to the heel bone or at the muscle juncture. Plantaris Tendon Achilles Repair: This technique is an ‘older’ procedure where a small/tiny tendon (called the Plantaris Tendon) is used to support or augment the Achilles tendon repair. The Plantaris Tendon is adjacent to the Achilles tendon making is ideal as its easy to access for surgeons, but its super small size makes it difficult to frequently utilize. Nonetheless, in some cases it can be extremely beneficial and an adjuctive or add-on procedure. Acellular Achilles Repair: Tissue grafts may be used to augment the Achilles Repair and there are several products available for surgeons to choose from. Here the graft is may be used to “wrap” the Achilles Tendon Repair after it has been sutured together. The tissue can be derived artificially, from animals or humans. Some surgeons find this technique useful whereas others prefer ones own body for healing potential. Allografts Achilles Repairs: Structural tendon grafts from another person are uncommonly used for acute Achilles Repairs. They would only be considered for tendon defects. Downsides of tendon allografts is that are often not readily available and involve tissue use from another person. Fortunately, they are not typically needed for acute repairs, and are rather used with chronic Achilles Tendon Repairs. In general, most Achilles Repair is performed with an incision located directly along the Achilles Tendon. Minimally invasive surgery allows for a smaller incision located directly over the Achilles Tendon rupture site, mainly for midsubstance ruptures. Here the sutures are placed “percutaneously” or through pinholes and passed through to the ruptures site where they are tied together for the repair. However, because the technique performed through limited access, the suture cannot be weaved in an interlocking fashion throughout the Achilles Tendon – though this may not make a significant difference on the recovery so long as the end result function is returned. In general, it takes the Achilles Tendon 6-8 weeks to repair itself, and more involved surgery can involve a longer recovery. 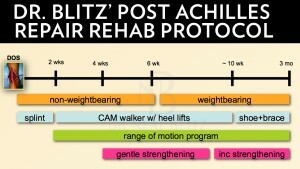 However, once the Achilles Tendon has mended physical therapy is often employed to gain strength and function back, a complete process that can be at least 3 months or so. After Achilles Tendon surgery, the limb could be placed in cast or a removable boot depending on the surgery, extent of the repair and surgeon experience. Depending on the strength of the repair, some surgeons will allow early range of motion of the ankle. Dr. Blitz’ post-operative protocol allows for very early range of motion of the Achilles tendon to regain proper function and strength. What Anesthesia Is Needed For Achilles Repair Surgery? Because the Achilles Tendon is located on the back side of the body, you will need to lay on your stomach for the procedure in a position medically called the prone position. The surgery may be performed as a general, spinal or regional. Depending on the extent of the Achilles Tendon Repair surgery, it can be performed as an outpatient or an inpatient. There are general risks associated with foot and ankle surgery surgery (or any surgery) and the use of anesthesia. Complications may occur and are not necessarily your fault, or the fault of your surgeon. Nonetheless, you should understand the risks. Achilles Repair complications include, but are not limited to: infection, pain (temporary or permanent), swelling, hematoma, bleeding, blood clot, poor wound healing, incision breakdown, poor healing, malunion, nerve injury, neuroma, pain syndrome, RSD, disability, recurrence, hardware problems, unsightly scar, stiffness, weakness, bulkiness of Achilles Region, inability to stand on toes, heel pain, need for revisional surgery, and/or catastrophic loss. When Is Surgery Not Performed For Achilles Ruptures? Most Foot & Ankle surgeons tend to recommend Achilles Tendon Repair surgery. The surgery is ideal for younger healthy active people. Sedentary “older” people may be recommended casting and crutches, especially in the presence of significant medical problems – but the decision for surgery is made on a case by case basis – determined by your surgeon.